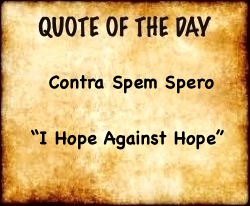 Benjamin was the last of the 12 sons born to Jacob (whose name God changed to “Israel”—Genesis 35:10) and his four wives. The 12 sons of Jacob became the 12 Tribes of Israel. Rachel was his last and favored wife and gave birth to Joseph of the technicolor robe and she died en route to Bethlehem giving birth to Joseph’s younger brother Benjamin. 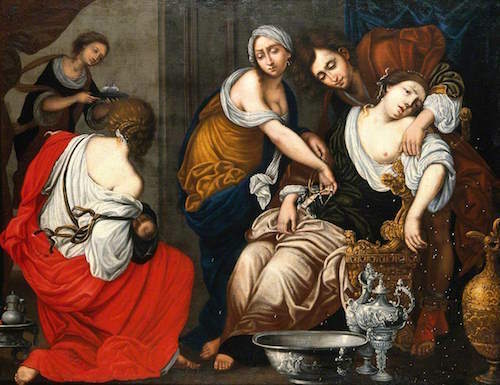 The Biblical Rachel may have died because the baby was in a breech position, had the umbilical cord wrapped around his neck or some other complication. 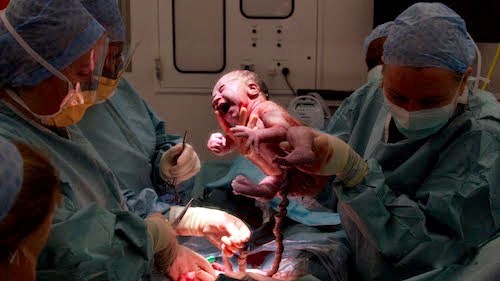 There have been 4,000 years of children born since Rachel died giving birth and four millennia of midwives and doctors trying to prevent mothers and babies from dying during the birthing process. One of the earliest records of a child being “cut out of the womb” because natural birth was not possible is found in the Chinese Records of the Grand Historian. It states that Luzhong, a descendant of the Yellow Emperor (died in c. 2598 BC), had six sons all of whom were born “by cutting open the body.” So Caesarean delivery is ancient. 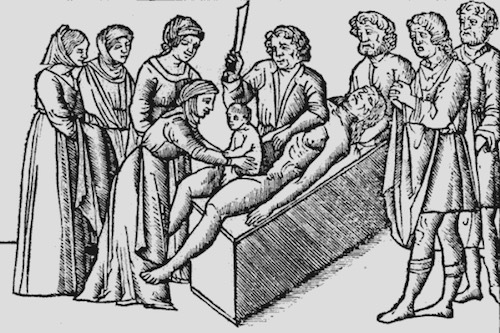 There are woodcuts and paintings from Medieval times depicting the practice of emergency Caesarean delivery in attempts to save the life of the mother and child. Medieval painting of dead woman. The doctor, holding the (unwieldy) knife, cut her baby out of her womb. Nurse or relative holds the live baby. 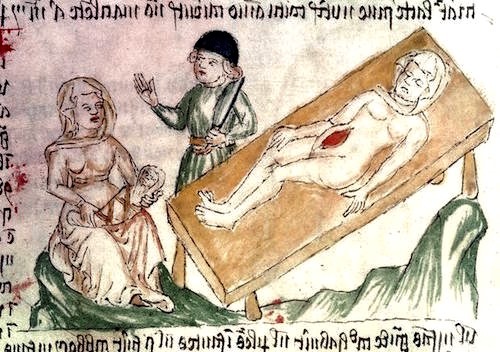 Medieval people were fascinated with purported ancient Caesarean births. 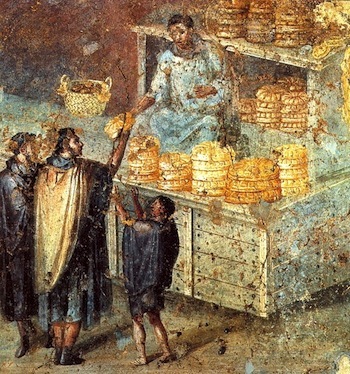 According to Greek mythology, Apollo, Asclepius’ father, thus removed Asclepius, god of healing/medicine, from his mother Coronis’ womb. 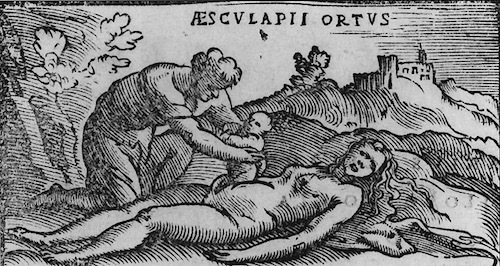 Since the name, “Caesarean,” appears to be connected to the birth of Julius Caesar (See OED), even though current scholars do not acknowledge that, there were woodcuts of Caesar’s Caesarean birth. Hundreds of years later in 1822 an elegantly-clad woman (below), post-delivery, shows off the stitches from her Caesarean. 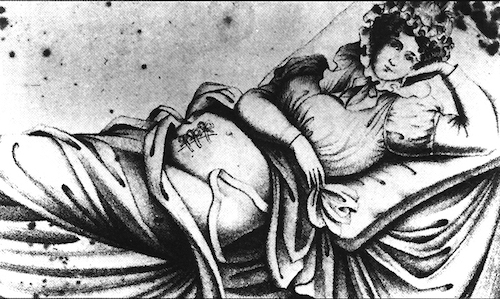 Caesareans by then, apparently, were more routinely performed—and women survived. From the earliest of human times through the times of Jacob and Rachel in the 1900’s BC, childbirth has been from time to time an iffy matter for women. 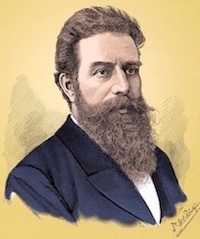 Most births are natural and complication-free as the baby makes her or his way through the “gates of life.” But it was not until the late 1800’s AD that a problematic position of a baby in the womb could be seen (and addressed) through an X-Ray. William Conrad Rontgen, a German physicist, who in 1895 discovered electromagnetic radiation in a range called X-rays, was awarded the first Nobel Prize in Physics in 1901 for his discovery.